The Authentic Foods Pancake and Baking Mix 7 lb is a unique, all-natural mix that is made from our stone-milled Garfava Flour and Superfine Brown Rice Flour. You'll find that the taste and texture of a pancake made with this mix is what you would expect from the Traditional American Pancake. 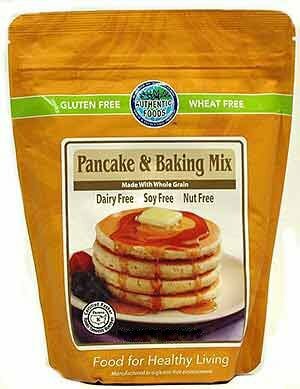 Pancakes made from this mix are a great way to start off the day refreshed and ready for a long day. It takes so little time to make the pancakes, that you'll even be able to make them on a weekday right before work. All you need to add is eggs, milk (or milk substitute), vegetable oil and maple sugar (or brown sugar). This mix also makes waffles, muffins, cookies, donuts, crepes and more. Ingredients: Brown Rice Flour, Garfava Flour (garbanzo beans, broad beans), Baking Powder, Salt, Natural Vanilla Flavor (gluten-free and wheat-free), Xanthan Gum. Gluten free, wheat free, soy free, dairy free, nut free, certified kosher by Rabbi Y Buckspan. Bulk bag perfect for chef's, restaurants, home-makers, schools, camps and anyone looking to stock up.